Helminthes. It sounds like a character out of a poorly written book that wants you to struggle with the pronunciation. Worms, now we all know what that means. Or do we? It’s not extremely common in the United States to hear that a child has worms, our pets, yes frequently – but not our children. You might think that a worm isn’t a big deal, but in the developing world it can take a severe toll on a child’s most formative years. Soil-transmitted helminthes, or the parasite so commonly called worms is one of the most common infections in developing countries. It can cause children to suffer from internal bleeding, causing anemia, it inhibits the absorption of vital nutrients, causes diarrhea, severe stomach pain, loss of appetite and itchy scaly rashes caused by secretions and waste that the worms release into the body. Children with worms often suffer from nutritional impairments and pain that causes them to lose focus at school. These tiny little worms can negatively impact a child’s growth and development and take away their energy levels. Helminthes are on the WHO’s list of 17 Neglected Tropical Diseases (NTD). NTD’s are a group of chronic disabling infections that affect more than 1 billion people worldwide, mainly in Africa and people living in remote rural areas, urban slums and conflict zones. So how do children get worms in the first place? Poor water and sanitation, which includes feces contaminating the soil and transmitting the eggs right into the feet of children who are barefoot. There are approximately two billion people worldwide that are infected with soil-transmitted helminthes. If you’ve never had a parasite inside of you, it’s quite painful. Even as an American with substantial access to healthcare, worms can be debilitating. So image this in a child that can’t receive treatment or relief from the pain and diarrhea. So how do we stop these microscopic enemies? Albendazole, health education and improvement of water and sanitation. Albendazole is the miracle drug when it comes to deworming children, and is an on the essential medicines list from the World Health Organization. It’s simple, beyond cost effective and can be given anywhere. This broad-spectrum anthelmintic is a single pill that is given twice a year, and doesn’t have to be administered by a physician. Large deworming campaigns at schools and clinics have seen high impacts. This is why we provide our partners with deworming medicines. It is critical in keeping children healthy. 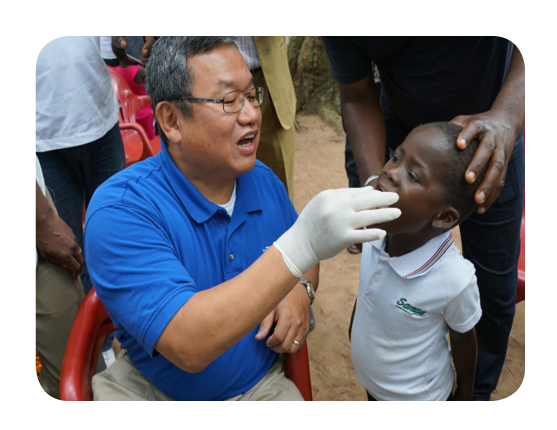 MAP provides over 1 million deworming tabs each year, treating 500,000 people. The price of Albendazole in the US has increased by nearly 4,000% since 2010, causing MAP to purchase in bulk from Europe to keep the cost down to around two cents per 200mg tablet. Ezekiel is now attentive in class and his marks have greatly improved in school. Now he can enjoy school and playing with his friends and lead a happy healthy life. We are currently preparing a shipment of 2 million Albendazole tabs destined for the West African country of Cote d’Ivoire where Ezekiel receives deworming medicines from MAP.